Our ColdCure® wraps work as excellent as hot packs too! But BFST® takes treatment to a whole new level! Hot Packs are the "old school" method for promoting blood flow. Heat up the affected area and your body will respond with increased blood flow to keep the area cool. The trouble with the hot pack solution is that they use conductive heat meaning that they heat your body from the outside in. First the hot pack heats your skin and then heat leaks down to the fat tissue beneath the skin and then heat moves from the fat into the underlying tissue. This is called conductive heating. Conductive heating is good in theory, but it is unfortunately quite ineffective. Our skin and our fat are protective layers to our underlying tissue. They are designed in large part to insulate our insides from external changes in temperature and they do that very well. As you heat your skin, blood flow increases there to whisk away the heat and protecting the underlying tissue. The same thing happens in the fatty layer. In reality, there is very little heat that actually can make it through the skin and fat into the underlying tissue. By comparison, conductive cooling (or cryotherapy) to control pain and swelling is more effective for that purpose because the cooling at least reduces the blood flow and as the blood flow lessens, the effective ability for the body to remove the cold becomes less. If your desire is to truly stimulate blood flow and relax underlying muscle tissue, BFST® is a far superior choice. BFST® treatments are designed to stimulate blood flow in the underlying tissues while minimizing the amount of surface heating. BFST® provides much better results than the traditional conductive heating approach. If you are determined on using hot packs though, our ColdCure® packs heated up are the best you will find in that regard. The same benefits of colder storage power, the gel remaining rigid and in place, and the benefits of extra replaceable packs all apply to their use as hot packs as well. 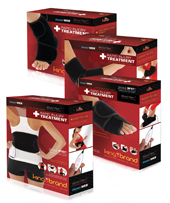 If you are going to use hot packs, our ColdCure® line of products is still the best option available. The same way you need to be careful about making cold packs too cold by putting them in the freezer, you need to take care about heating up hot packs. It is very easy to heat any hot pack to the point where it can damage the skin. Burns from over heated hot packs are very common and we do not recommend this choice. Our packs will heat up quickly in a microwave without damaging the gel, but microwaves can easily heat up a gel pack to be much too hot for the skin. No matter what hot compress you are putting on your body, you should always heat the gel pack in hot water and not a microwave. If the hot water you are using to heat the pack is too hot to touch, then your gel pack can be too hot as well. Always test carefully before putting anything hot on your skin. Again, the safest and most effective way to stimulate blood flow and relax stiff muscles is by using Blood Flow Stimulation Therapy (BFST®) not hot packs. BFST® is much safer and much, much more effective. If you're serious about treating your body with the best possible solutions, get BFST Technology® from King Brand®.